Entering this website, your visitors will get into the comfort and coziness of modern home interior. Large background images will give them a good idea of what they can purchase at your store and how these furnishings will look in their apartments. Semitransparent upper service menu bar seamlessly blends with template's environment. Logo is in the center. Menu, company details and social sharing blocks are placed in the footer. The buyers can move to the store just clicking 'GO TO STORE' block. You can purchase this theme and start your blind and curtain business straight away. 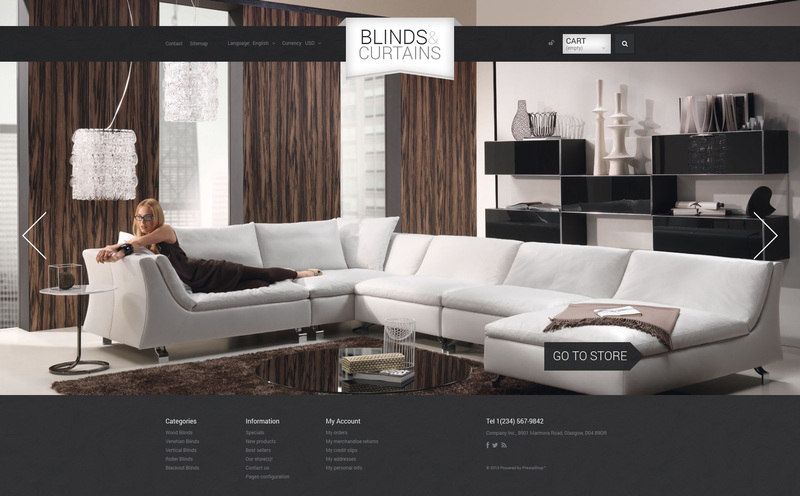 The template is best for online blinds and curtains as well as interior and exterior stores.